Can’t believe that the month of March has arrived! Excited in a good way as this means that Spring is on its way and days of sunshine are to follow. I was pleasantly surprised that my Topbox arrived on the 8th as I only received a shipping confirmation email early the same morning. How does that work?! I posted last month that the February topbox was the fastest to be shipped. Let me correct that: March has definitely been the fastest month that the box has shipped thus far. It’s great, but completely unexpected. 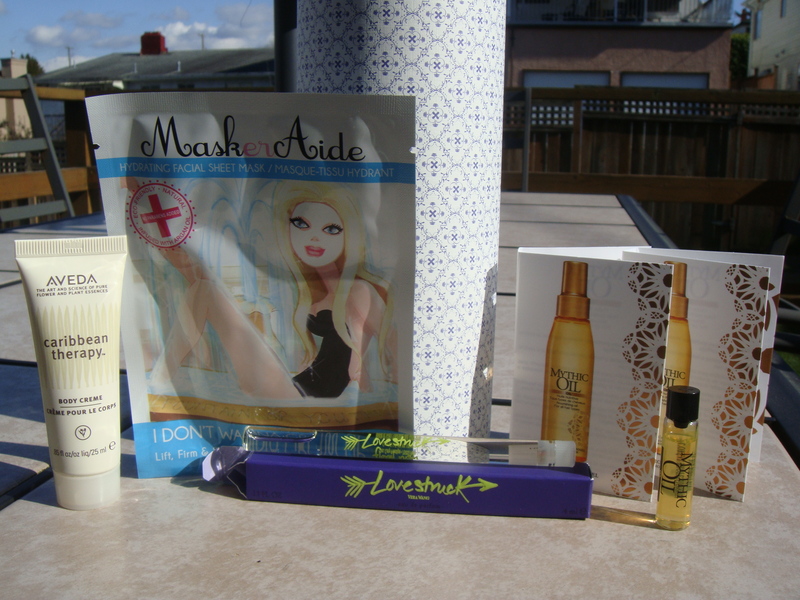 I have yet to make a “wish list” for a Prive box as this month’s choices did not really appeal to me. I have seen customers complain about receiving only 2 products, but I believe the descriptions for each Prive box clearly state how many products you will receive. Sure, Topbox does say that it aims to provide at least 4 products each month, but if you pick a Prive box that shows 2 products, then that is what you’ll receive: 2 products. That could be the downside of the Prive boxes, but I do believe that the “2” products would be full size unless stated otherwise. – This definitely has an herbal kind of smell to it. I haven’t really tried Aveda products, so it will be interesting to how hydrating this body lotion is. It is a decent size, good for travel. – This product is supposed to nourish your hair. Is it similar to Moroccan Oil? I do own Moroccan Oil and love the effects that it does to my hair: it makes my hair feel super soft and silky. I will try this mythic oil out and see how it compares. – I have received one of these masks in a previous topbox, but it had different properties. This mask is supposed to “lift, firm and soften fine lines.” I still have yet to try the other mask that I have, but I have heard good things about these! – Not too fond of receiving a perfume sample in this month’s box. Topbox used to have an option of not receiving perfume samples in their monthly quizzes, but it was not guaranteed. I think they took that option away, but what if you are allergic to perfume?! What a waste of a sample that would be because you wouldn’t be able to use it. I don’t mind getting perfume samples, but I really don’t want to receive them as I don’t wear perfume too often and I find myself with all these tiny vials just sitting there in my drawer. I would much rather receive anything other than a perfume sample as I would probably find more use out of it. This Vera Wang sample however is quite a decent size compared to the tiny vials that are usually provided. It smells lovely, but I could see this easily cracking and spilling if it’s in your purse and you accidentally throw something heavy on to it. The packaging just makes it seem so fragile as it’s so thin. I also don’t like how difficult it is to open this as the stopper seems to be super tight. Overall, I feel that the products in the recent topboxes have not been as great as to when I first subscribed a year ago (You’ve probably heard that already). I’ll give it maybe a couple more months, but if I don’t feel impressed then I will have to give this up. I stay subscribed because I’m *waiting* for a box to just blow me away again! I don’t want to regret unsubscribing and then a fantastic box comes along. Sigh. What did you receive in your March Topbox? That’s unfortunate that you received a repeat product! Yes, we can keep hoping that next month’s box will be better. I have chosen a pure and simple topbox this month. I knew there would be only two products, a china glaze nail polish and a bronzer. I’m happy with the nail polish as I really wanted to try this company. As for the bronzer, I’ve not tried it on yet but the case itself is very cheap and I’m lucky it didn’t get here broken. If you want to try another sub which is SO GOOD….. it’s LIPFACTORYINC. They are based in Florida, they charged 26$ per month but you get a box filled with 7-8 full size items. Even if they are called Lipfactoryinc they are not just about lips. Every 4 months they will do an only lip box..which is this month by the way. Check their website where you can see past boxes. They have excellent customer service and often add free bonus items in their boxes. I hear that some of the blushes/bronzers from that pure and simple box arrived cracked/broken from some members. What a shame! Thanks for the suggestion of Lipfactory, I will check it out and see what it’s about. I am not impressed with the top boxes I have seen so far. I was not at all interested in any of the prive boxes, so I opted for the regular box, but not at all excited to get it, now that I’ve seen what’s inside. I am going to give them one more month, if it’s no better, I will cancel and subscribe to starlooks instead. I feel the same way! The products seemed better when I first subscribed a year ago. I have never heard of starlooks, I’ll check it out. It’s hard to keep up with all these beauty box subscriptions! This month’s Topbox doesn’t look that good. There are many other beauty subscription box brands to choose from though so don’t feel discouraged. Yes, there are so many different ones– is there one in particular that has been worth the subscription in your opinion?